" The heartworm life cycle begins in the mosquito. Only worms that mature inside a mosquito can grow inside a dog. The mosquito then passes larvae into dogs that can grow up to 12 to 14 inches and live for years inside the dog." 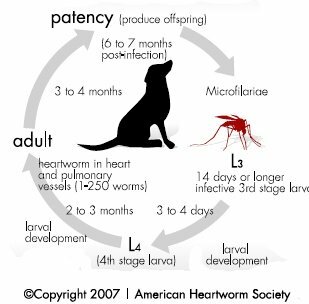 The heartworm life cycle starts inside the mosquito. When a mosquito bites an infected dog, they absorb microfilariea (young worms) into the mosquito. The microfilarieae start to develop inside the mosquito. Development continues for 10 days to 14 days. These macrofilariea continue to grow until they become what is known as larvae. Larvae is another word for an immature worm. The larvae get passed to a dog when the mosquito bites the dog. During the bite the larvae transfer from the mosquito into the dog and enter through the bite made by the mosquito. Over a 6 to 7 month period, the heartworms will grow up to 12 inches and move through the blood into the heart arteries and lung. If male and female heartworms are present, they will produce more macrofilariae. The macrofilariea cannot develop into an adult heartworm without first maturing inside a mosquito. A heartworm can live inside a dog for 5 to 7 years. Given this long lifespan, a dog can be bitten by more than 1 mosquito over several different incidents and be passed heartworms each time. Unfortunately, blood tests, the best way to determine if a dog has heartworm, cannot detect the presence of worms if they have been inside the dog less than 6 to 7 months. The initial signs for heartworm in dogs include coughing, weight loss, decreased appetite and a reluctance to exercise. Symptoms may not appear for months or years. Many of the symptoms will develop over time and are not easy to distinguish from other diseases since the canine heartworm symptoms are general (e.g. ; appetite loss is associated with many diseases). In severe cases dogs can develop liver disease and heart failure. As the worms grow they can block blood flow that carries needed oxygen in the body. As the body and lungs become oxygen deprived, the heart beats harder, possibly resulting in heart failure. Severe cases of canine heartworm result in a condition called caval syndrome. Associated symptoms include difficulty breathing, pale gums, darkened urine and a dog that is very reluctant to move. Treatment for heartworm involves an adulticide given by injection into the dog followed by several weeks of rest (4 to 6 weeks). After treatment a preventative is used to avoid future problems. Treatment is highly effective. In severe cases surgery is used to physically remove the worms. Veterinarians where mosquitoes live will recommend that dogs take a heartworm preventative. Most have the added benefit of also helping dogs either avoid other worms (Heartgard Plus, Interceptor). Both are given orally via a flavored chewable 1x a month. Other products such as Sentinel help to avoid fleas. Revolution heartworm protection also protects against fleas. There is also 1x every 6 month injection that is available called ProHeart 6, however it only protects against heartworms. A good source for discount heartworm medicine is VetMedicines .